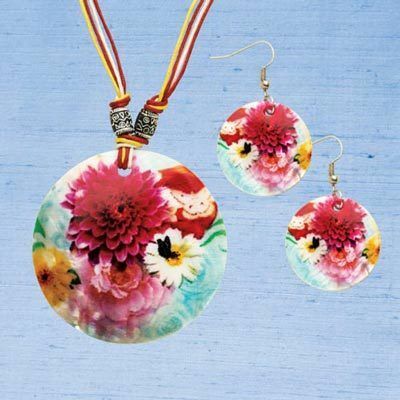 Bold Artisan Bouquet Shell Jewelry Set features natural capiz shell discs covered in a brilliant flower pattern and crafted into a dramatic drop pendant and French wire earrings. Silver-tone beads give each piece an added touch of glamour. Necklace, 2½"l pendant on 16"l three-strand cord; Earrings, French wires, 2"l. Hurry! Quantities are limited!